This is chapter 9 of my book, Man of the World. I remember watching Mel Gibson’s movie Brave Heart years ago. No one who watched that movie can forget the dramatic ending where, during intense torture, the main character cries out, “Freedom!” Freedom is a yearning within all people. Unfortunately, outside of Christ there is no freedom. Only He can bring the freedom our soul longs for. Sin enslaves all people. And religion without Christ cannot set a single person free. For those who strive to be free in the flesh, seeking freedom through religion, they will receive only weariness, toil, and disappointment. But, for those who come to Christ, a glorious freedom awaits them. The true Man of the World comes only to steal, kill, and destroy. Satan seeks to lead us into the land of religion and ritual that is devoid of life. He creates rules and generates anxiety. He wants people to think of God as a heavenly IRS agent desperately seeking to find something wrong with you so He can smite you. He wants to create division amongst people by getting them to become suspicious of each other. He wants people to distrust each other, hate each other, judge one another, and hurt one another. He has done a good job. Lifeless religion has been the source of contention and strife for as long as history has been written. The reason there are so many different denominations is because there are no shortage of people hurling contempt upon others in the name of God. Fallen people are always looking for reasons to divide. It takes a spirit filled person to see imperfect people and, knowing they too are sinners in need of a savior, love them as Christ did. “Reckless words pierce like a sword, but the tongue of the wise brings healing” (Proverbs 12:18). The other day I was watching the trailer for a movie. I think it was about King Arthur and Merlin. One scene depicted a young Merlin waving his hand over a dead flower and bringing it back to life. Wouldn’t it be great to have that kind of power! The reality is that in a certain sense we do. And it’s a power we often overlook. While waving my hand over something broken will not fix it, or bring it back to life, we all have the ability to speak life into the life of a broken person or a broken situation. We can make sure we do not contribute to their brokenness by being critical faultfinders who are looking for ways to show others what they are doing wrong. And we can use our words in a way that builds others up. With our words we have the power to heal and fix things that are truly broken. I am reminded that when God created this amazing world and universe we live in He did so by speaking it into existence. 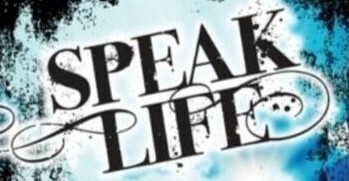 When God speaks life is created and life blossoms. When we encourage someone we cause them to be confident. A Leader (to be distinguished from one who is simply in charge) has the unique ability to make people confident in such way that it causes them to improve, to do what they need to do to change, or to just be a better person. No one likes to be disciplined. I remember getting in trouble when I was in third grade. I don’t recall what I did at school, but I have a vivid memory of my dad’s response. He sat me down and asked me what I did. While I don’t recall what that was, I do remember that I lied to my dad about it. That was the only time my father laid a hand on me. It hurt. I did not like being corrected. But it had a very positive effect. I don’t lie. I learned that lesson at a young age. And I learned that lesson because I had a father who loved me enough not to let me get away with lying. His love cured me of that sin. Resist the urge to be offended. There are many in our culture today who are offended at everything, and they feel compelled to tell you how offended they are. We have entered an age where not being offended is seen as a right; and being offended makes one a victim. Unfortunately, many people have been truly hurt by the “victims” of those who offend. However, if you are a Christian, before you jump on the bandwagon of cultural sensitivity claiming to be offended by what someone says or does, just consider a few things. To make the claim that you are offended means that you have climbed the lofty perch of righteousness. You have arrived at the superior moral plane where your refined moral sensibilities have elevated you above your peers. Hence, when you claim to be offended, you are looking down upon the groveling mass of ignorant plebes who have no right to disturb your sense of peace and wellbeing. They can’t possibly know what it’s like to live with such a refined sensitivity towards what is truly right, proper, just, and good. Just the suggestion that you enter into their filthy little world by trying to understand why one might say or do something that you can’t possibly be associated with is an outrage! You see, the burden is for such people to become sensitive to how righteous you are, and then make sure that, when in your presence, they act accordingly. To make the claim that you are offended means that you have climbed the soaring heights of intellectual superiority. You are offended precisely because they are ignorant, stupid clods who should have immediately understood that, in your presence, the only appropriate response is to listen and learn. Speaking about things that are contrary to your exceptional intellectual acumen is not only insulting, but suggesting that you should condescend and spend time with such people is absurd! To make the claim that you are offended means that you have assumed the towering post of an existential existence that necessarily places you in the top tier of ontological reality. As Isaiah was confronted with the majesty of God (see Isaiah chapter 6) upon entering His presence, so too, those who enter yours should have a similar response. And, if they too should appropriately humble themselves before you, then you can bestow your magnanimous mercy upon them. The Bible says that “No prophecy of Scripture is of any private interpretation” (2 Peter 1:20). In a day and age when it is all too common for people to pass the opinion plate concerning their impression of what any given verse of the Bible means, it is necessary that we, from time to time, remind ourselves that the Bible was given to us from a loving God. There once existed a time in the world (not too long ago) when people who lived any distance apart communicated via the written letter. To write a letter was considered both a skill to be learned and an art form to be cultivated. Words were carefully chosen to convey ideas and feelings. Today, we live in an instant communication society where the written word has become nothing more than graffiti with punctuation. We quickly send-off emails, texts, and tweets without giving thought to the importance that words play in our communication. I suspect if people were reduced to the written letter to communicate with loved ones today, they would give careful consideration to the words they use. When God wrote the greatest love letter every written, the Bible, He was very careful in the words that He chose. And he was careful because He wanted to communicate some very important, and specific truths to those He loves. When we open that love letter our Job is to seek to understand the heart of God. I want Christ. I want the fullness of God. The Bible tells me I can have that. The Bible tells me I can have all of Him. Wow! I can be filled with the fullness of God! I can have God’s joy. I can have God’s peace. I can have God’s life. I can have it all! And I want it – all of it. I am greedy for God. It is interesting that the Bible clearly indicates that people who claim to be believers will unfortunately be cast from His presence into hell (Matthew 7:21-23). This raises a very important question about faith: how can a person of “faith” go to hell? Or, how can believers who serve the Lord still be condemned? Some might argue the reason is because people ultimately will be judged according to their works. While it is true that works are a sign of genuine salvation, works cannot earn one a place in heaven. If that is true, then what is the answer?